Serve up these Garlic Baked Chicken Breasts as an entrée tonight. These cheesy, garlicky chicken breasts are perfect for busy weeknights. Mix all ingredients except chicken. 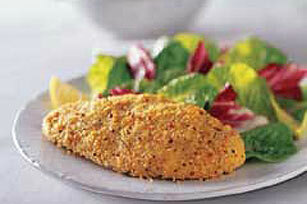 Moisten chicken with water; coat with crumb mixture. Place in single layer in shallow baking dish sprayed with cooking spray. Spray top of chicken with cooking spray. Bake 20 to 25 min. or until chicken is done (165ºF). For a more golden appearance, after chicken is done, set oven to broil. Broil chicken 2 to 4 min. or until golden brown. Prepare using GOOD SEASONS Italian Dressing Mix. Coat chicken; refrigerate 1 to 2 hours before baking. This will also help the cheesy coating adhere to the chicken.